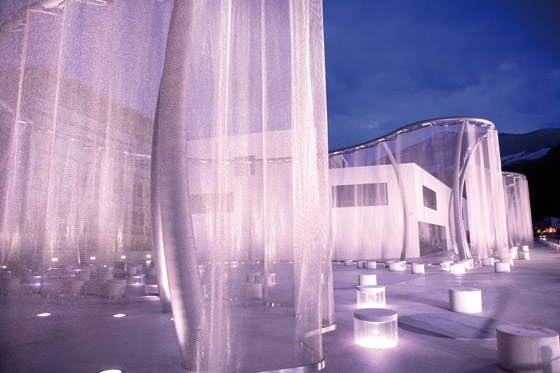 Luxury crystal glass brand Swarovski graced it's headquarter building in Wattens (Tirol), Austria in a nearly 250 meter long transparent metal curtain. 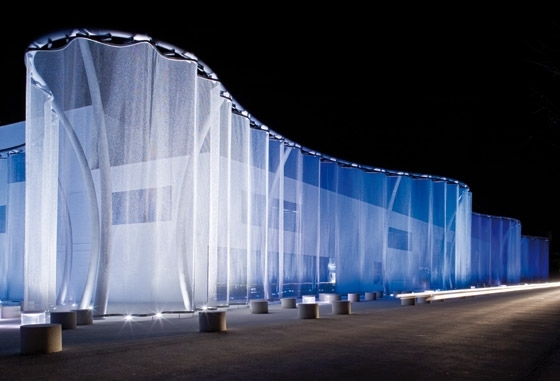 The semi-transparent veil by Design studio Regina Dahmen-Ingenhoven was the winning entry in the competition to design an object for the entrance at the Swarovski factory. 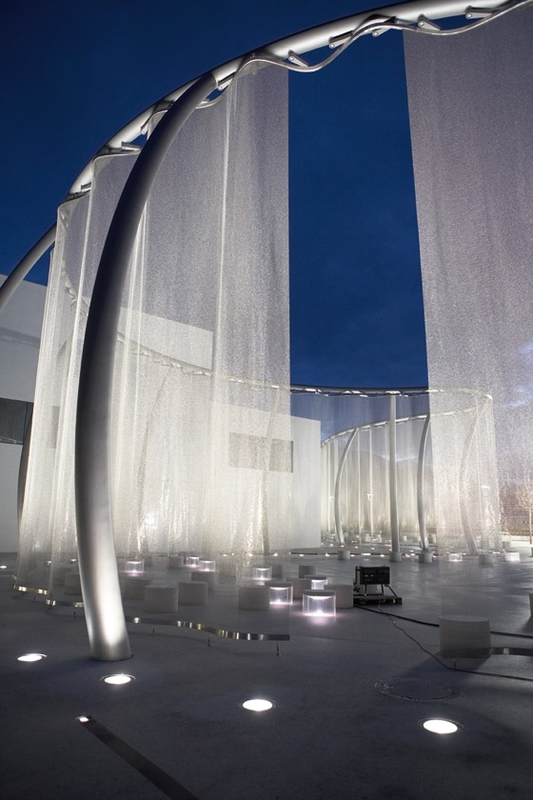 The veil is made of a corrosion and weather resistant stainless steel mesh, held by a 10-meter high steel structure. 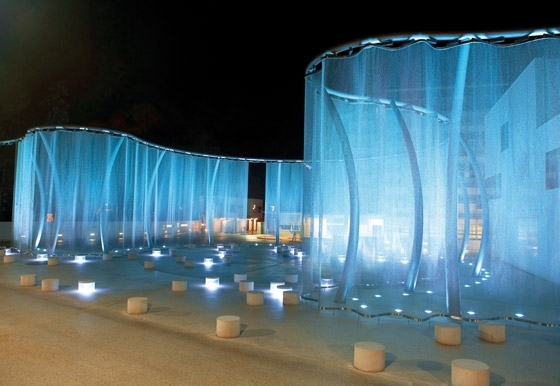 The fabric is made of 26,250,000 flexible stainless steel rings and is dynamically illuminated by night. The unique curtain's sleek, sculptural fabric interacts during the day with the sun and passing clouds in a fascinating play of light and shadow. At dusk, the light show begins as static colour scenes interact with the shifting shades of the evening sky, illuminated by 133 in ground mounted floor spots with colour (CMY) and dimmer feature. Through gentle colour changes, the visual impression of the curtain material is transformed. Sometimes the curtain is lit in a rich gold-tone; at other times in a mystical blue or a clear, bright white. At other times it is illuminated in a variety of colours and moving effects, like a light refractive crystal, continuously changing the curtain's appearance. 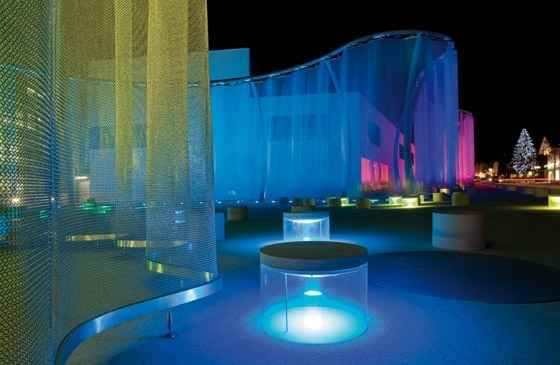 The main theme of the installation and the used colours is the Aurora Borealis (named after the Northern Lights) – a crystal created in 1956 by Swarovski and Christian Dior. The veil should imitate the colours of that crystal. The scene is completed by special designed 40 illuminated pads with integrated LED-spots and inside RGB colour mixing. They although can be used as a seat. Additional lighting fixtures for the street and trees complete the installation. All lights where automatically controlled by a central lighting control system with integrated GPS tracking system.